Safeguard your content, share it generously, and inspire your tribe. 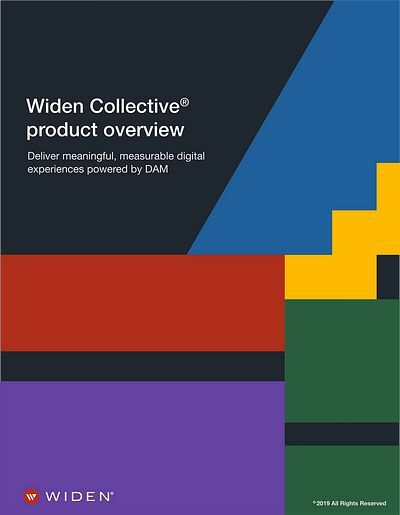 From DAM and content analytics to portals, web-to-print templates, and online proofing, the Widen Collective® integrates the tools you need to manage all of your digital assets. Give your team the content they need, the tools to customize it, and the power to share it. Tag, clip, transcode, embed, convert, stream video, and publish assets all from one content marketing hub. Portals and collections let you group and share assets for easy viewing and downloading without going into your DAM system. When you publish an asset using embed codes and edit the master file, Assets will automatically update it wherever it lives online. Now that's something to toast. Our global content delivery network lets you serve content around the world from multiple data centers with the highest availability and performance. Assets protects your brand with version control, asset expiration dates, and image rights. Translation: You’re protected against image use lawsuits and brand damage. House your brand story and make the DAM system your own by using the logo, colors, and images that reflect who you are. If you can't find the connectors you're looking for, you can always do it yourself with our API. Manage all of your users with enterprise-grade information. Our flexible governance controls ensure security and scalability. Once your assets run their course, archive them to reduce storage costs and preserve a historical record. It’s like a comprehensive family photo for your brand. Control what users can see and do in your DAM system, and monitor who's using your digital content where, when, and how. Who needs a megaphone to keep everyone on track? You can manage project comments and revisions in one place with our online proofing and approval tool. Build your martech stack on top of our DAM solution, a true content marketing hub for all your content activities. We integrate with AI image recognition, creative suites, marketing automation, CRM, and much more. Want more? See our resource library.